Spring's just now beginning to get a toehold here so March wasn't very pretty. But where the flora fell short, the fauna made up for in spades. This month's bin is a handful of images of some of the critters that have wandered by over the past couple of weeks. It's not necessarily great photography, but it's life as we know it here; unexpected wildlife visits and hasty attempts to photograph them with whatever gear is within reach. 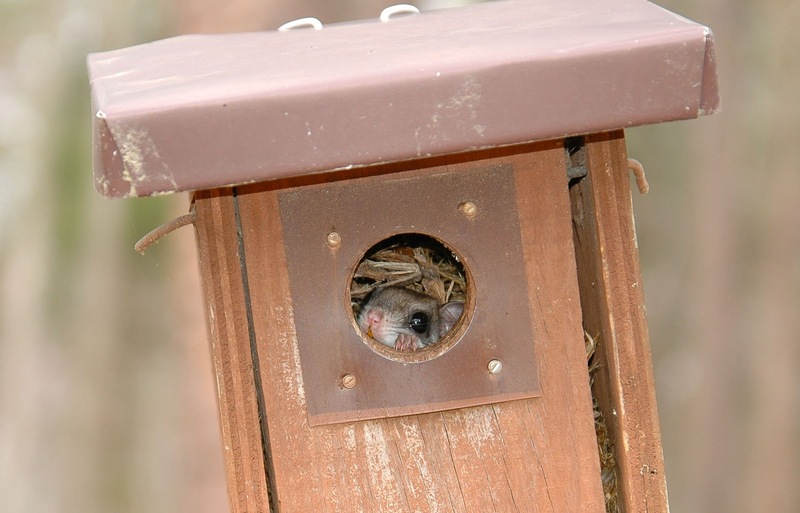 One of the best parts of March is that the bluebirds begin to nest. We have five bluebird houses around the place and I took my first walkabout of the year to check for activity in the various boxes. 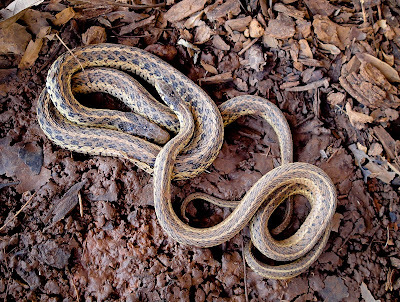 Not wanting a face full of sharp beaks and claws from startled moms, I make a lot of noise when approaching and then tap the sides of the houses before peeking inside. When thumping the box furthest from the house, deepest into the hardwoods, a momma did indeed flee, but not what I was expecting. 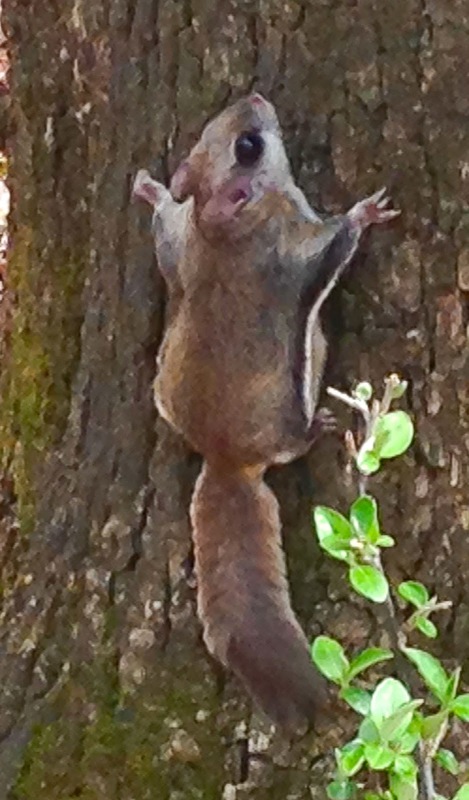 My knee-jerk response was "bat," but as the creature sailed to the base of the nearest tree I saw that it was a flying squirrel; the first I've seen in these woods. Having only my cell phone, I snapped the picture to the left from a distance, so apologize for the poor quality. I raced to the house and grabbed some better glass but when I got back the glider had returned to the box. Not wanting to disturb her again, I snapped the picture above as she kept a wary eye on me. Sometimes, though, the wildlife is not quite so wary, though often direct contact with our newly cleaned windows has a bit to do with it. 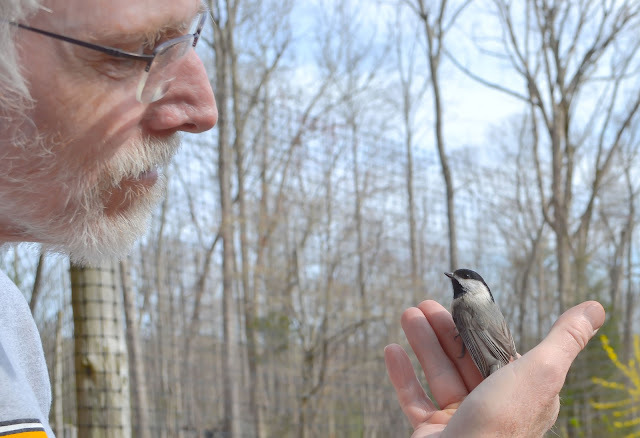 This chickadee took a while to rearrange his marbles, but was happy to be carried around for fifteen minutes or so while doing it. Mary took this shot of the bird and me contemplating one another; probably each trying to decide who had the bigger beak. 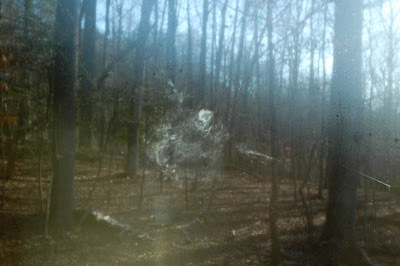 And speaking of birds and glass, I had to laugh when I saw this imprint on our bathroom window, invisible until I began to steam things up with a shower. Based on its size, it appears a mourning dove did a full-body beak plant. All I could think of was Wile E. Coyote and the cliff face. To finish the bird theme, I offer the above. 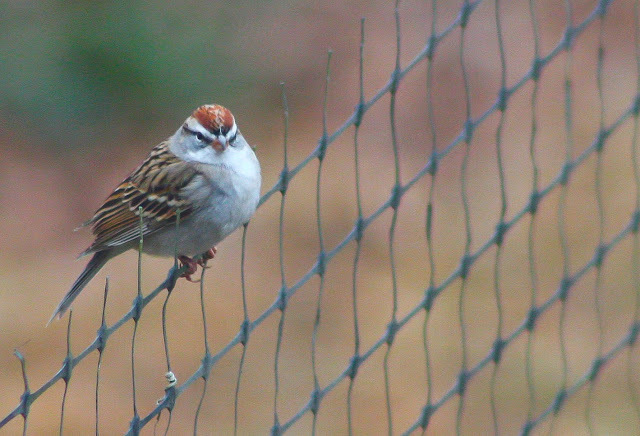 I was excited about this shot, thinking I had captured the image of a common redpoll perched on the garden fence; excited because redpolls aren't all that common in this part of the country. I shot a note off to my naturalist and photographer buddy Mike (who's starting a pretty cool blog of his own at the Road's End Naturalist) to report the sighting and he burst my bubble, suggesting that what I had actually captured was a... well, see if you can figure that out. And no, it's not the model for the Angry Birds video game. Our neighbors are not all cute little feathered friends. 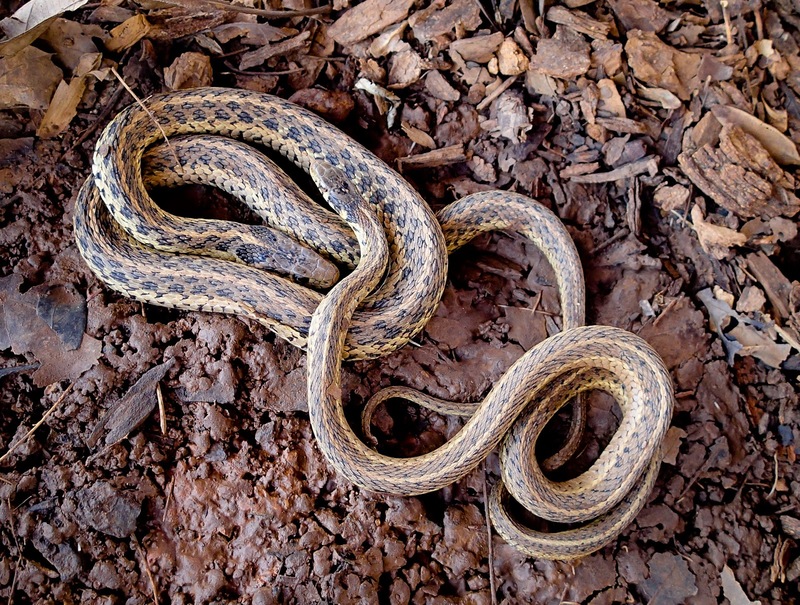 When moving some terra cotta pots around, I found this pair of garter snakes curled together under one of the larger ones. Startling, of course, but very, very cool. And finally, a poor shot of a regular around here. I often see this brilliant yearling hanging around the lower ridge where our gravel road forks from the main paved artery through the "neighborhood", but I never seem to have a camera with me. I got lucky the other day, though the deer was at a distance and the lighting was extreme. 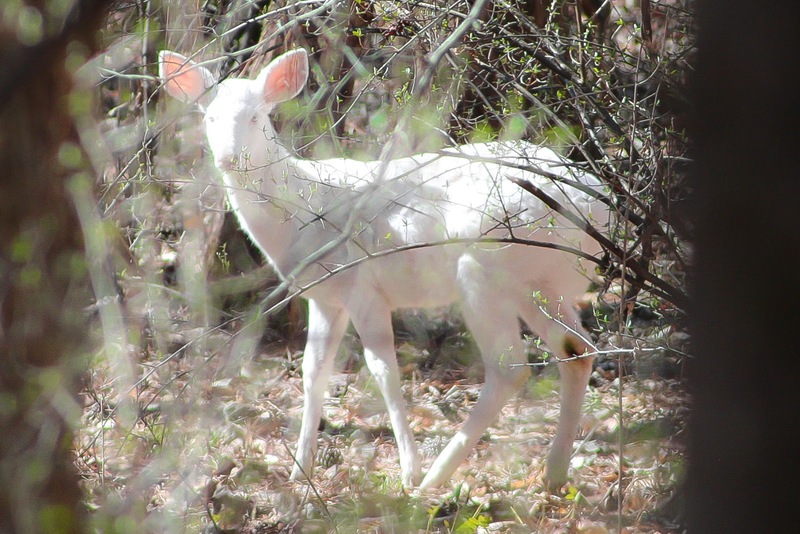 Each year seems to bring a new albino or piebald fawn into the area. I don't know if there's a strong genetic predisposition in the local population, but, for whatever reason, there's always a ghost or two wandering these woods. Just one more of the many charms of living here in southern Heaven. And one of the many reasons to always keep a camera close at hand. Such a great post and pictures! That dove print makes me laugh. Growing up we had large south-facing picture windows, and mostly in the winter months when the panes reflect the bright backyard we would get a couple good imprints a day. Thanks Sara. And your spring flower pics have been quite lovely. I laughed too, Alex. We get more than our share of "imprints" but this one was just too perfect. He caught it square. Can't say that I'm familiar with the bald sparrow, Zuner. Will have to look that one up. THANKS! Hey, Mike, that little bird and you have something in common. You both have a hard head, beak, and take about 15 minutes to shake it off. Tee Hee! I am jealous of your albino-tinged deer population, Mike. Twenty-four years just down the road from you a ways, and I've never seen one. Dozens at a time of the regular sort, but never a ghost. 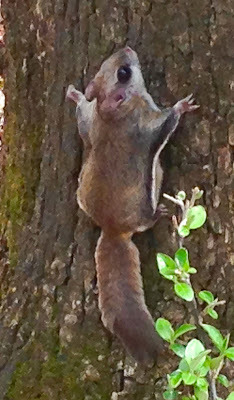 Or a flying squirrel for that matter. Must be the magic of that ridge top. Oh, Mel. You know me too well. There's a little bit of magic here, for sure, Cathy. You need to come by and see.